The Zone, The Carbohydrate Addict's Diet, Protein Power - today's hottest diets depend on one thing: cutting carbohydrates. But it's tough to cut carbohydrates when you're eating on the go. 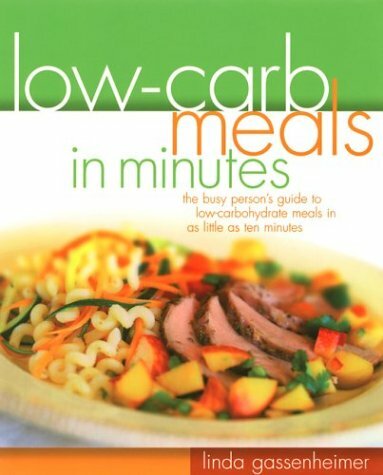 This book gives people a practical way to make low carbohydrate eating part of their busy lives. Linda Gassenheimer has developed six weeks worth of low-carb meals. Her daily and weekly eating plans provide mix-and-match recipes for breakfast, lunch, dinner and snacks that fit within the guidelines of a variety of low carbohydrate diets. For extra-busy days, she includes quick-assembly meals that can be made in ten to fifteen minutes. All her recipes, such as Walnut Crusted Chicken with Vegetable Creole, Portobello Mushroom and Ham Omelet and Greek Salad, emphasize the use of low-fat proteins, mono-unsaturated oils and low glycemic carbohydrates. And Gassenheimer's easy-to-follow instructions include cooking tips, ready-made shopping lists, convenient guides for eating out, and time-saving suggestions for streamlining the cooking process.